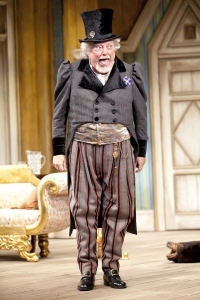 David Sabin as the Judge in STC's production of The Government Inspector. Photo by Scott Suchman. Along with being one of the founding documents of Russian drama, Nikolai Gogol’s The Government Inspector also functions as a case study of a corrupt society. Everyone in Gogol’s nameless provincial Russian town—from the Mayor who gives construction contracts to his own family members, to the members of his cabinet who try to outdo each other with bribes for an out-of-town official—is as crooked as Richard III’s back. Even the townspeople are shown to be unreliable: the local innkeeper cheats customers out of their money by putting rats in the soup, and his wife is cheating on him with the blacksmith. The play’s cynicism about civic life is universal and all-encompassing. Gogol’s plot in the play is simple but ingenious, one of the all-time classics of comic construction. A nobody—Hlestakov, our out-of-town official—is mistaken by Gogol’s gaggle of corrupt provincials for a powerful Revizor, a “government inspector” sent by the Tsar from St. Petersburg to spy on them. Of course, once the town officials (who are desperate to break the law to curry favor with the Tsar) meet with Hlestakov (who is penniless and desperate to take advantage of illegal gifts and bribes), the mistaken identities lead to a comic cavalcade of criminal mischief. Before we know it, Hlestakov is wooing the Mayor’s wife and daughter, both of whom are irresistibly attracted to his patina of power, and promising the Mayor a place in the Tsar’s own retinue. It is a mark of Gogol’s genius that this situation, a ripe one for comedy, also contains the seeds of social observation. In one memorable scene, before he flees the town, Hlestakov fields complaints from the local townspeople, hearing stories about the Mayor’s vast array of human rights abuses, cheap cronyism and graft. In 1830s Russia, just putting these characters on a stage was a revolutionary act. Nothing like them had ever been seen before, and such a blunt observation of life’s inequities was previously unthinkable. But Gogol is careful not to lose the comedy amid the corruption. When Hlestakov asks the townspeople, such as Abdullin the Merchant or Chernyaeyev the Tailor’s Son, what he should do about these social problems, their solution is simple. Send the Mayor to Siberia, they say, where he can be tortured until he’s dead. When Hlestakov asks the townspeople for “loans” to help expedite this process, they are just as quick as the bureaucrats to bribe a public official in the name of personal gain. The Government Inspector premiered to great success in St. Petersburg in 1836, at the express orders of Tsar Nicholas I, who roared all the way through. “What a play!” he is rumored to have said. “It gets at everyone, most of all at me!” But Nicholas’ government officials were incensed by Gogol’s work. They said, perhaps rightly, that they themselves were the targets of Gogol’s satire. The ensuing uproar in polite society was so intense that Gogol felt he had to flee Russia for Europe, eventually settling in Rome. He would live the next 12 years in self-imposed exile, returning to Russia only a few years before his death. In the meantime, his works had entered the canon, defining Russian identity for the stage through a unique combination of social comment and humor. 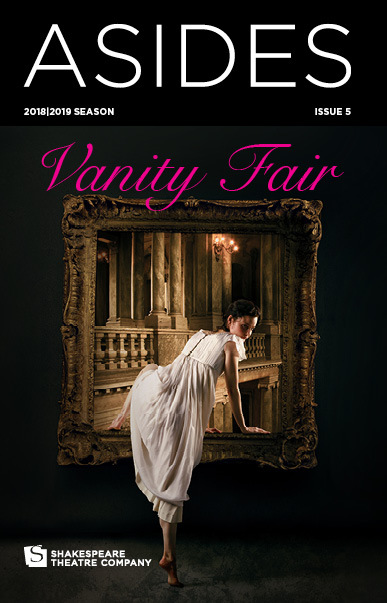 In the decades following Gogol, Russian dramatists such as Alexander Ostrovsky and Anton Chekhov would write similarly lacerating portraits of a corrupt society. And, like Gogol, they often used humor as the vehicle of their commentary.